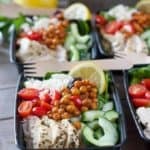 Easy Greek Salad Meal Prep Bowls with Roasted Garbanzo Beans! – All made on one sheet pan and popped in your oven! Yay lunch all week! Imagine looking forward to your lunch every day! No, it’s a not a dream! All you need is a sheet pan, a sharp knife and you are smiling at noon all week long! On top of being all pretty and stuff, this beautiful Greek Salad with Roasted Garbanzo Beans clocks in at only 350 calories! And thats with the Tzatziki dressing! Way to make room for Happy Hour! I have listed out specific measurements below the recipe card, so you can make the perfect 350 calorie salad! 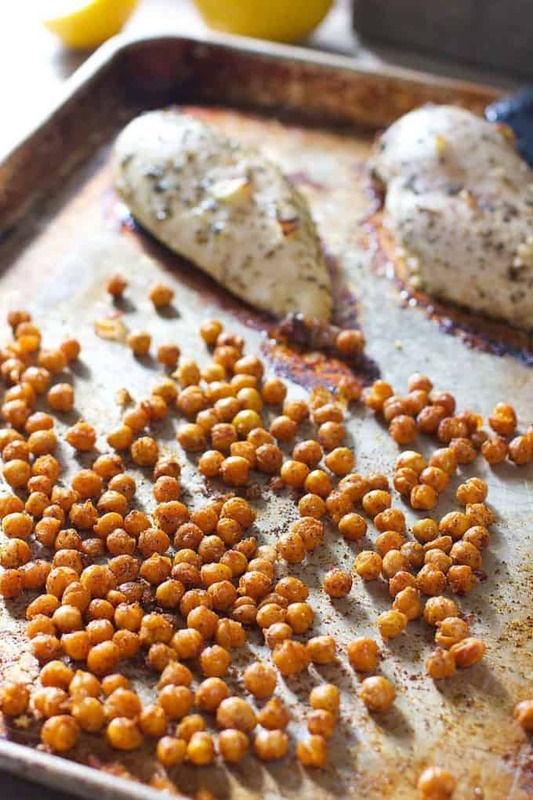 You will have some roasted garbanzos left over…like that could be a bad thing! And don’t forget about the easy recipe adjuster tool located within the recipe card. Makes increasing or reducing the servings a snap. Roasted garbanzos are one of my new fave snacks. Crunchy, a little spicy and a perfect topping for a salad.. And incredibly easy to make! You simply toss the beans with a bit of oil, spices and roast in the oven. NOTE: Drain, rinse and pat dry the beans. Less moisture makes for a crunchier roasted bean. The chicken will sit in a simple 30 minute marinade while you do the veggie chopping. Roast the chicken and beans on the same sheet pan! I love these food prep containers from LIFT. They are dish washer safe and reusable. At only about a buck a piece, it’s a pretty good deal. It keeps the crunchy stuff away from the not so crunchy stuff so your salad stays…well, crunchy! I also recommend these disposable bamboo forks…kinda cute, super cheap. Just the way I like my stuff! Cute and cheap! 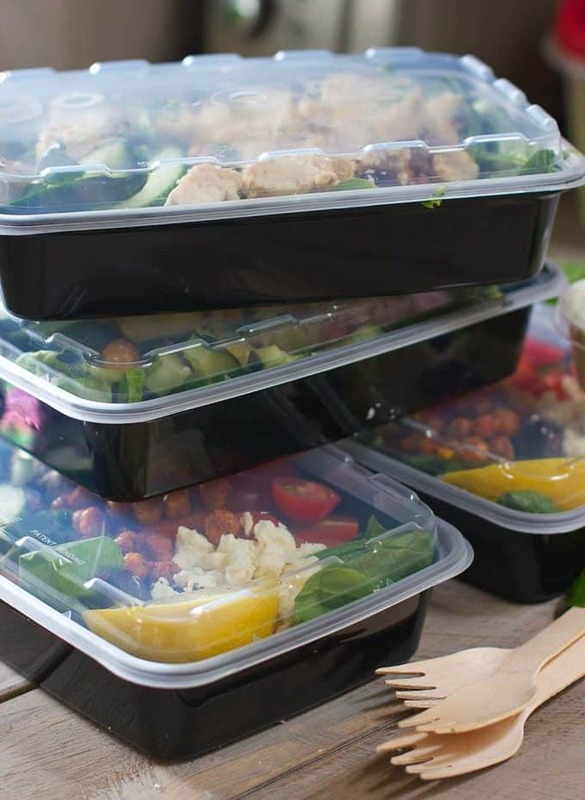 Wouldn’t you love to look in your fridge on Monday morning and see these Greek Salad Meal Prep lunches all ready to go! For the dressing. I cheated, (big surprise). I used store bought Tzatziki dressing. They have some really great brands in the cooler in the produce section. I like OPA brand. (Not a sponsor of this post, just like their stuff.) If you want to make your own, you can see my recipe HERE as part of my Layered Hummus Dip recipe. You can see all my HEALTHY MEALS HERE! Here are a couple of our favorites are Sheet Pan Chili Lime Fajitas Cauliflower Rice with Mushrooms and Feta – all these would make great lunch time meal prep! To Fast, Fresh and Healthy Meals! A super easy meal prep that starts with just one sheet pan. A little chopping and you have lunch all week! This clocks in at only 350 calories including the dressing! Hello Happy Hour! Combine all marinade ingredients in large ziploc baggie. Add chicken breasts. Store in refrigerator for 30 minutes or up to 8 hours. Drain and rinse garbanzo beans. Pat dry with a paper towel. Remove chicken from ziploc baggie and discard marinade. Drizzle a large sheet pan with 1 tablespoon olive oil. 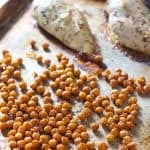 Spread the dried garbanzo beans on one half and place chicken breasts on the other. Sprinkle garbanzo beans with chili powder and cumin. Add a pinch of salt and pepper. Add an additional teaspoon of olive oil to the garbanzo beans and toss. Bake chicken and beans at 400 degrees for about 25 minutes or until chicken is cooked through. Toss beans one time during cooking. Cool completely before adding to your containers. Line up containers. Place 1/4 of the spinach on one side of the container. Chicken on the other. Divide up remaining ingredients evenly. (for exact measurements to stay at a 350 calorie count, see below notes). Pour Tzatkiki dressing in small container and store in refrigerator! To create a perfect 350 calorie Greek Salad Bowl! How many days can i keep this in my fridge? 4 seems to be the magic number for me. I usually only prep that many because there always is at last one lunch out somewhere! Can you please clarify what you mean by ” It keeps the crunchy stuff away from the not so crunchy stuff so your salad stays…well, crunchy! ” — the containers appear to be just one large compartment — so no way to keep anything away from anything else? Good Morning CJC! I simply meant the container is long and flat so you don’t have to put salad ingredients on top of each other. It helps keep them separate that way. :). I’m all for getting organized for lunches so I’m not reaching for the bad stuff when I’m starving! Great post! Thank you Elaine! It was a fun post to do and made lunch super tasty all week! I absolutely love your post! 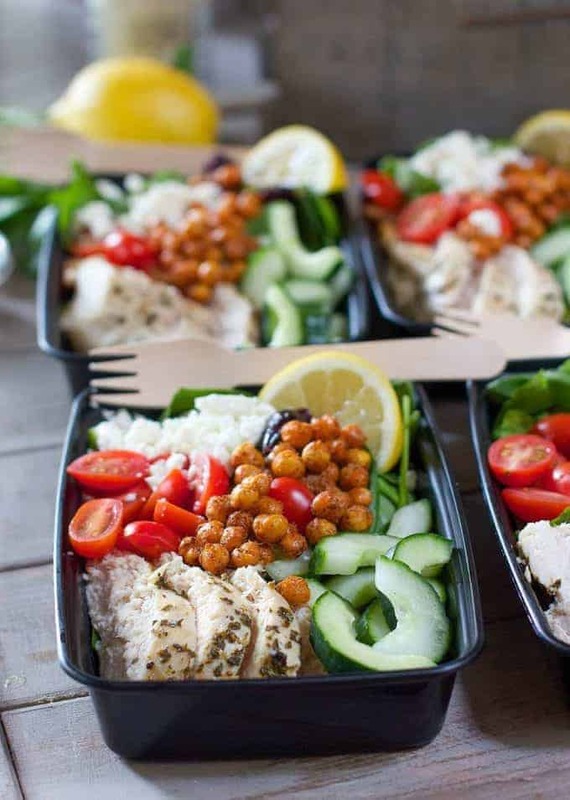 I adore the idea of making lunches ahead so you can just grab them when you’re ready! I am also going to look into those containers and forks…too cute! Pinned. Thanks Susan! I’ll be posting a few more meal preps throughout the summer. It was super fun to do! If only I would meal prep yummy salads like this, I wouldn’t rely on Panera so much! 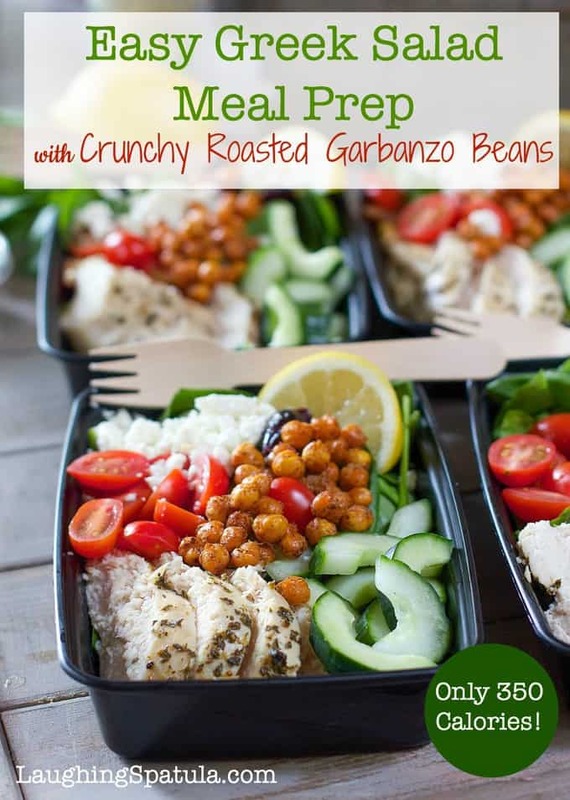 I love the addition of the roasted garbanzo beans!